Aim: Stereotactic body radiotherapy (SBRT) for the treatment of nodal oligorecurrent prostate cancer (PC) is increasingly used with only small patient series being reported so far. We set up a multi-institutional collaboration evaluating toxicity and outcome. 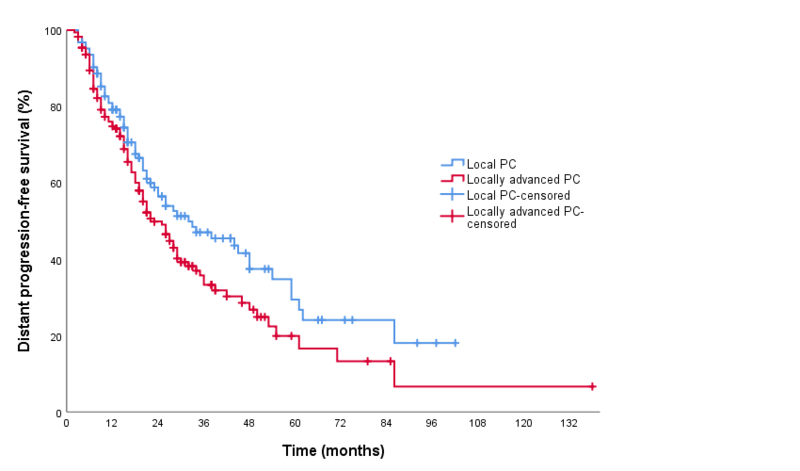 Materials and methods: PC patients with a nodal oligorecurrence (≤3 lymph nodes, N1/M1a), following primary curative treatment, were included. The minimum dose for SBRT was 5 Gy per fraction with a biological effective dose of at least 80 Gy to all suspicious nodes. 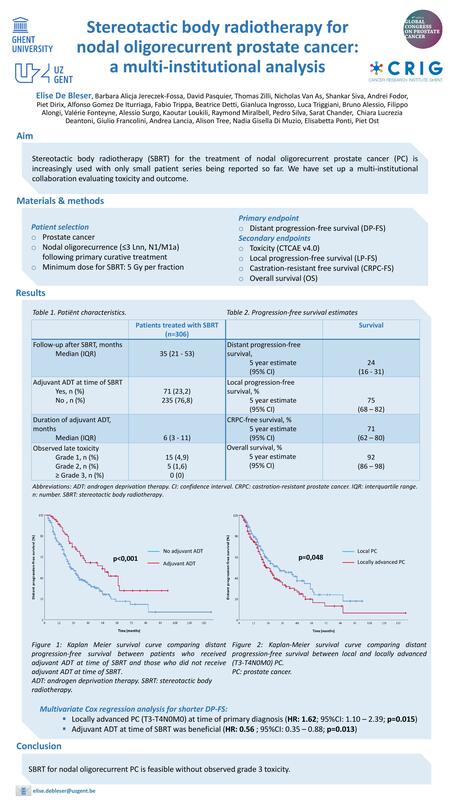 The primary endpoint was distant progression-free survival (DP-FS), defined as any new lesion after SBRT outside the radiotherapeutic field. Secondary endpoints were toxicity (CTCAE v4.0), local progression-free survival (LP-FS), castration-resistant free survival (CRPC-FS) and overall survival (OS). Uni- and multivariate Cox regression analysis were used to identify independent risk factors for LP-FS, DP-FS, CRPC-FS and OS. Results: A total of 382 lymph node oligometastases were treated in 306 patients with a median follow-up after SBRT of 35 months (IQR 21 – 53). 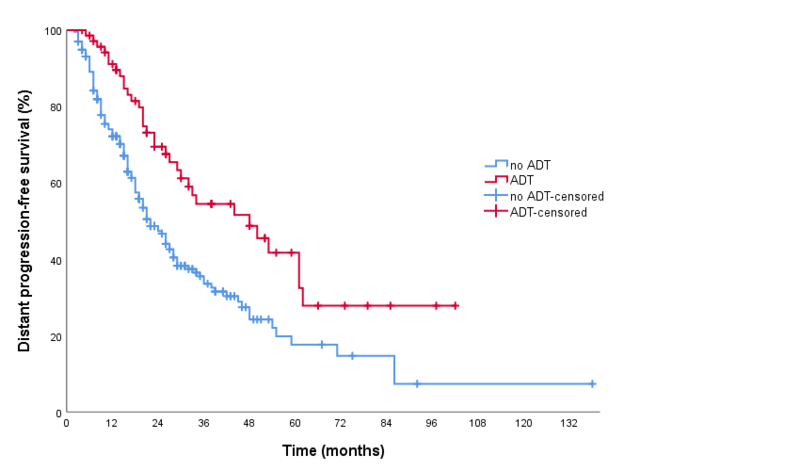 Adjuvant androgen deprivation therapy (ADT) was given in 71 patients for a median duration of 6 months (IQR: 3 – 11). The median DP-FS was 26 months (95% CI 22 – 30). Of the 173 patients that showed progression following SBRT, 73% had ≤ 3 new metastases and 66% relapsed in nodal regions again. In multivariate analysis, locally advanced PC (T3-T4N0M0) at time of primary diagnosis (HR: 1.61; 95%CI: 1.10 – 2.39; p=0.015) and no adjuvant ADT at time of SBRT (HR: 0.56; 95%CI: 0.35 – 0.88; p=0.013) were independent risk factors for a shorter DP-FS. The 3- and 5-year estimated LP-FS was 85% (95% CI: 81 – 90) and 75% (95% CI: 68 – 82), respectively. The estimated CRPC-FS was 89% (95% CI: 84 – 93) at 3 years and 71% (95% CI: 62 - 80) at 5 years. The 3- and 5-year estimated OS was 98% (95% CI: 96 – 99.8) and 92% (95% CI: 86 – 98), respectively. No independent risk factors could be identified for the other endpoints. Late grade 1 and grade 2 toxicity was seen in 15 (4.9%) and 5 patients (1.6%), respectively. No grade ≥3 toxicity was observed. Conclusion: SBRT for nodal oligorecurrent PC is feasible with minimal toxicity. Half of the patients are free of progression at 2 years. Three out of 4 patients that progress, remain oligometastatic.